Earlier today, the Braves completed a trade for Brandon Phillips. All they gave up was Andrew McKirahan and Carlos Portuondo, two relievers who were not expected to contribute to the club. The Reds are also eating almost all of Phillips remaining $14m on his contract (that expires this year), so this was a pretty cheap move oveall. The car crash Sean Rodriguez was in this winter is what led to the trade. Rodriguez will reportedly be out for 3-5 months due to shoulder surgery as a result of an injury sustained in the crash, even though he was reportedly unharmed in the wreck. It really stinks that Rodriguez is not going to play for most, if any, of the season. He was one of the players I thought could be a big difference maker if he supplied the type of power he did last year, and because he can play basically anywhere on the diamond. Apparently, the Braves had a trade set for Phillips in November that Phillips blocked prior to the Braves signing Rodriguez. I assume Phillips accepted the trade now, at least partially, because being asked to accept at minimum three trades (one to the Nats and two to the Braves) over a two year period signals that you are not exactly welcome any longer. The Reds also have a number of middle infield prospects, including our old friend Jose Peraza, ready to step in and get a shot at regular playing time. 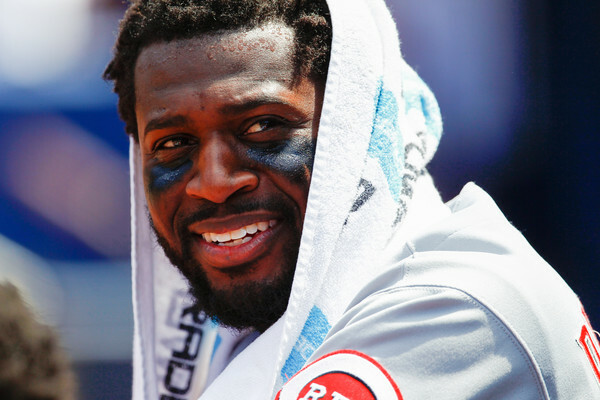 So, what exactly are the Braves picking up in Brandon Phillips? Above is his hitting performance from 2016, courtesy of @SandyKazmir at The Process Report. Phillips, similarly to Ender Inciarte who I analyzed last week, has always been one of the better players in the league at avoiding strikeouts. He can rather consistently make contact and has a pretty even disbursement of balls hit to each side of the field. He swings a lot and is one of the worst players in baseball at taking walks. This would make him a much better candidate for the bottom of the order rather than the top of the order. I would expect him to slot in behind Nick Markakis as the team’s six hitter, but I could also see Brian Snitker moving him to the early part of the lineup — which I would not advise given his low walk rates. Last year, Phillips really struggled in the first half with a 74 wRC+ across 343 plate appearances. His second half was significantly better, as he hit .335/.350/.478 with five home runs and nine stolen bases across 241 plate appearances and 59 games. The fact that he was still able to hit that well in the second half gives me at least some confidence that Phillips isn’t completely “done” as most 35-year-old middle infielders are. Defensively, Phillips really struggled last year according to the advanced metrics. Advanced defensive metrics are best used over three year periods, and using that time frame the metrics still speak relatively highly of Phillips (+3 DRS and +8 UZR over the past three years). However, being 35 and playing the middle infield is not a very common trait. Since Phillips debuted in 2002, there have only been a few second basemen that have provided positive value defensively at age 35+. It is possible that Phillips’ bad year defensively is just an aberration based on the stats being not 100% reliable on a year-to-year basis, but it is more likely that he is getting older, slower, and losing ground compared to his competition. For his career, being a positive defender has been arguably Phillips’ best attribute. I still believe he has the athleticism to not be a total Uggla at second, but I doubt that we should be anticipating a big plus defensively at second base. One of the more attractive parts of this deal is that it allows Jace Peterson to be the team’s super utility player. The Braves plan on using a four man bench, so having a player like Jace who can play basically every position is valuable. He can play third base against difficult right-handed pitching, and he can spell Phillips at second, obviously, or any of our outfielders. Given the current roster structure, it is likely that Peterson and Chase d’Arnaud will act as the backup centerfielders, though the hope would be that Inciarte is playing as often as Freddie Freeman does. Along with moving Jace to a utility role, this also certainly puts Ozzie Albies back in triple-A for the foreseeable future. Unless Phillips really stinks and Albies really hits at triple-A, I do not suspect we see Albies up at the major league level for at the earliest a few months. Of course, injuries happen and one to either Dansby Swanson or Phillips could cause the Braves to move Albies up quicker. But this trade, to me, signals that the Braves think Albies can use some more work in the upper minors before being deployed as Swanson’s middle infield partner. Given that Albies just turned 20-years-old, I do not mind letting him develop more physically and get a better handle on upper minors pitching. He has only been seeing professional pitching for three years, so getting a lot of plate appearances against borderline Major League ready pitching should help him hone in the skills that will eventually make him a solid regular second baseman. Overall, this is basically was a very cheap way to hopefully mimic the production the Braves would have received from Sean Rodriguez. Phillips does not have the positional flexibility that Rodriguez has, but Peterson does and he will now be deployed in the super utility role that was originally pegged for Rodriguez . Steamer expects Phillips to continue to decline to right above replacement level. I am a bit more optimistic than that, and suspect that Phillips’ contact skills remain quality enough to keep his wRC+ around 90 with decent second base defense. That should net out to around a 1-1.5 win player. For the cost of close to nothing, it is a trade worthwhile, in my opinion.